Early this year I posted about achieving ultra-low emission limits for medical waste incinerator scrubbers. 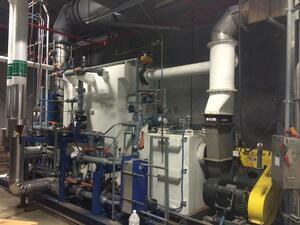 An example was given for a captive incinerator at the University of Texas Medical Branch (UTMB) in Galveston, TX. It’s one of the only systems in the United States permitted as a “new” medical waste incinerator according to the EPA HMIWI (hospital, medical, and infectious waste incinerator) MACT standard. This standard has the most challenging emission limits found in industry today. That is because in 2009 the EPA completed a source review and revised the standard based on a MACT-on-MACT analysis. Data used to set limits for each pollutant was individually based on waste feed and not incinerator/scrubber technology performance. This resulted in emission limit reductions for lead (Pb), cadmium (Cd), and dioxins/furans (D/F) that were orders of magnitude below the previous standard and below the capability of installed equipment. The impact of the new standard is discussed in greater detail in a 2013 blog post and corresponding paper from the Air & Waste Management Association (AWMA) International Conference on Thermal Treatment Technologies and Hazardous Waste Combustors (IT3/HWC).. Existing incinerators needed to be upgraded with add-on controls to meet the new standard. New incinerators need air pollution control equipment capable of extraordinarily high removal efficiency for particulate, Pb, Cd, and D/F. 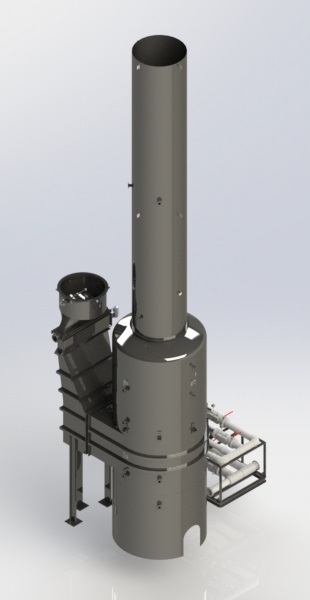 A new medium sized incinerator between 200 to 500 lb/hr capacity, has the additional challenge of meeting NOx. A medical waste incinerator can be tuned to a NOx limit of about 130 ppmv. The MACT standard limit for a new medium sized medical waste incinerator was set at 67 ppmv which means NOx abatement is required to guarantee compliance. 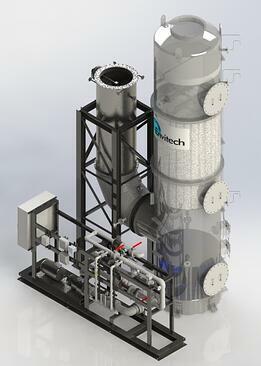 Envitech is building two scrubber systems to treat exhaust gases from two new medical waste incinerators that will treat captive waste at a research facility. The incinerators are permitted as new medium size incinerators which must meet the 67 ppmv NOx limit. The scrubbers have an equipment arrangement for meeting emission standards for PM, HCl, SO2, Pb, Cd, Hg, D/F, and opacity. The schematic below shows the components of the gas cleaning system. 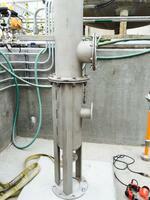 The quencher is used to cool the gas to saturation and remove large particulate. The packed bed condenser/absorber sub-cools the gas and removes acid gases with caustic injection. The Venturi scrubber removes particulate and the majority of heavy metals. The gas then passes through additional polishing controls to meet the ultra-low emission limits for Pd, Cd, Hg, and D/F. The polishing equipment includes a re-heat duct followed by a filter and carbon bed adsorber. 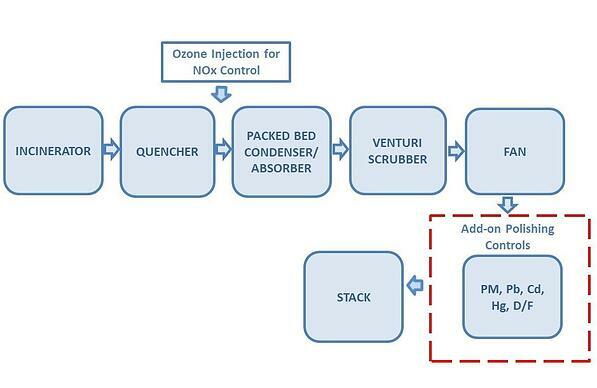 NOx removal is achieved by injecting ozone injection into the quencher outlet. The siz e of the condenser/absorber is increased to provide sufficient residence time for ozone-NOx reactions to occur. Ozone is highly selective for NOx relative to other combustion products. The NOx is rapidly converted to water soluble species. NO and O3 react to form NO2 and O2. NO2 and O2 react to form N2O5 and O2. N2O5 and water react to form 2HNO3 which is readily absorbed with caustic solution. Envitech used it’s rectangular scrubber design for the condenser absorber. To maintain a modular design and make it shippable. The vessel was flanged connected and shipped in two pieces. 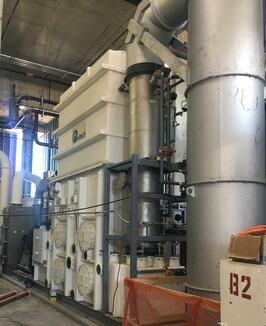 The scrubber system otherwise looks like a typical medical waste incinerator scrubber except the condenser/absorber is double the height compared to systems that do not require NOx control. The system has been built and shipped to the site. The major components are installed at the facility. 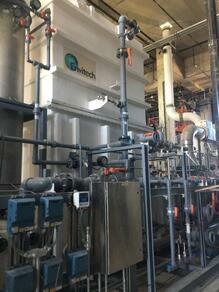 Envitech will deliver a water treatment system in 2019 to treat the scrubber effluent before it is discharged to the facilities main water treatment system. System Start-up is scheduled for 2020. Click on the link below to download a case study and other medical waste incinerator scrubbing literature. There are many applications that require packed bed absorbers for scrubbing SO2. Some applications previously blogged about include refinery sulfur recovery unit tail gas treatment units (SRU/TGTU), geothermal power generation, and waste oil re-refining to name a few. Another SO2 scrubber example is gas cleaning equipment for a mineral processing application to recover gold and silver from mine sites with low grade ore. Discovered and patented in the early 1900 by Charles Merrill and later refined by Thomas Crowe, the Merrill-Crowe process is a common separation technique for removing gold and silver from a cyanide solution using zinc dust. Gold and silver precipitate (concentrate) is the product of the Merrill-Crowe process. Furnaces are then used to recover ingots from smelting Merrill-Crowe precipitate. Fluxes are mixed with the precipitate to bring impurities to the surface. The precious metals settles down and can then be easily removed. Envitech is currently building an SO2 scrubber to treat the exhaust gases from a melting furnace for a South American precious metals refinery mining project. Furnace off-gases are in the 300oF to 500oF range and contain particulate and SO2. A bag-house removes particulate from the gas before passing downstream to the packed bed absorber for SO2 removal. Gas is first cooled to saturation in an evaporative quencher using re-circulated water. In the case of a pump failure, an emergency spray nozzle provides an independent source of water controlled by a thermocouple. Water that has not evaporated flows from the quencher into the packed bed absorber sump. Gas from the quencher enters the bottom of the absorber and travels vertically upward through a packed bed. Recirculated water is sprayed over the packed bed and mixes with the counter current gas. A dilute solution of plant-supplied sodium hydroxide is metered into the scrubber recirculation line to neutralize acid gases and is controlled by pH of the absorber sump liquid. The scrubbing water is collected in the sump and is re-circulated to the top of the packed bed and to the quencher. A blowdown stream is taken from the recirculation line to purge the system of reaction products. After the packed bed, the gas passes through an entrainment separator to remove water droplets entrained in the gas during scrubbing. The gas then exits the scrubber and is exhausted to atmosphere through an ID fan and stack. The scrubber scope of supply includes a quencher, packed bed absorber, instruments, control system, recirculation pump, piping, valves, and fittings, ID fan, and metering pump. The unit will be pre-assembled to the fullest extent possible with pre-mounted instruments pre-wired to a control panel. The assembly will be broken down as necessary for shipment and packaged for export to South America. Bilingual submittals are provided for the O&M manuals and engineering submittals. The scrubber will be delivered and started up in Q1 of 2019. Click on the link below for a case study on the Merrill-Crowe Refining Furnace SO2 Scrubber and a packed bed absorber cut sheet. Venturi scrubbers are mechanical impaction devices that are used to control particulate on a wide range of applications. These include medical and hazardous waste incineration, potash drying, sewage sludge incineration and processing, coal drying, mineral wool manufacturing, and copper roasting to name a few. In one of my last blog posts I discussed a Venturi collision scrubber used to treat exhaust fumes of a Banbury mixer for rubber compounding. The Envitech collision scrubber is used in several Goodyear Tire manufacturing facilities around the world. A recent new application is a horizontal Venturi scrubber for an aggregate asphalt drum dyer. The asphalt process is semi-stationary operating at fixed locations for several months at a time. The process is periodically broken down and moved to new locations for operation. The horizontal arrangement makes the horizontal Venturi scrubber an ideal solution for mobile applications. The equipment package is transportable on a single flatbed with only minor disassembly required for shipment and installation. 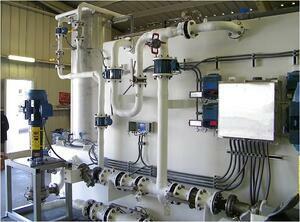 The equipment is mounted onto a skid with pre-assembled piping and wiring to facilitate equipment mobility. Particles are captured in the horizontal Venturi scrubber through a process of impaction by water droplets injected into the Venturi throat. A fraction of particulate laden water becomes entrained in the gas which has a droplet size distribution. The droplets are removed from the gas by a mist eliminator. There are two pathways for particles to escape capture by the scrubber. The first is penetration. Smaller particles lacking the mass for impaction penetrate through the scrubber. The second is through carry over of particulate laden water droplets. Droplet capture efficiency, or mist elimination, therefore impacts scrubber efficiency and overall plant emissions. The horizontal Venturi scrubber uses a damper blade and actuator to maintain constant pressure drop across a wide range of gas flows. A high efficiency chevron mist eliminator removes particulate laden droplets before the gas exits the scrubber. A chevron mist eliminator removes greater than 99.9% of water droplets down to 27 microns with less than 0.25 inches W.C. of pressure drop. By comparison, a cyclonic separator requires several inches W.C. of pressure drop to remove 98% of 27 microns droplets. The advantages of a chevron mist eliminator are higher performance, larger turn down ratio, and lower pressure drop. Envitech is currently building two new horizontal Venturi scrubbers sized for 45,000 acfm each for a peat drying operation. The compact design allows the scrubber to be easily installed inside a building. The high level of pre-assembly and lower profile reduces installation time and improves maintenance access for plant personnel. The horizontal Venturi scrubber can be a cost effective alternative to many processes that use a typical vertical arrangement. 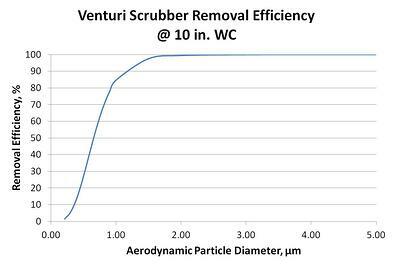 Click on the link below to download Venturi scrubber literature. Packed bed absorbers are often used to treat gaseous emissions for reasonably large gas flow rates ranging from a few thousand cfm to greater than 70,000 cfm. Common emissions include SOx, HCl, HF, and NOx. The absorbers are often custom engineered for a specific plants and have been used for secondary lead smelters, geothermal power plants, waste oil-re-refiners, ceramic tile manufacturing, waste incinerators, and ethanol plants. The types of emission sources range from thermal oxidizers, regenerative thermal oxidizers (RTO’s), furnaces, kilns, direct fired heaters, incinerators, fermenters, vent tanks, and batch mixers. 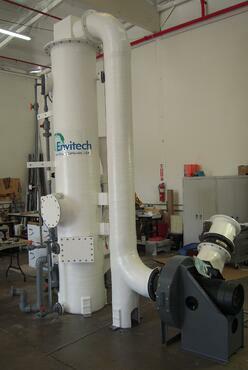 Envitech developed a lab scrubber to provide an economic solution for smaller gas flow rate applications. The lab scrubber is a packaged unit designed for high efficiency of water soluble contaminants and can handle up to 2,000 cfm of gas at a maximum temperature of 180°F. The system is engineered for reduced footprint at 4 ft x 4 ft and includes a pre-wired control panel and pre-piped service utility connections requiring minimal installation and maintenance costs. 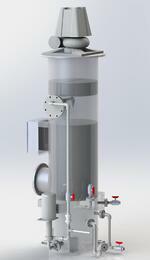 Scrubber units are configurable to different levels of automation and treatment applications. 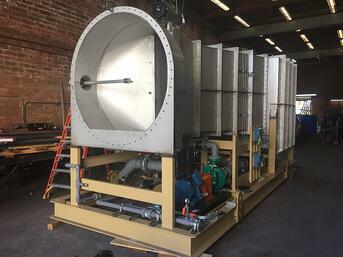 A recent lab scrubber is for a manufacturer of pharmaceutical products in Southern, California. The scrubber is designed to remove HCl from the exhaust of several small laboratory process vent streams. The vent streams includes low organic concentrations which are incompatible with many common plastic materials. Special resin was selected for the fiber reinforced plastic (FRP) vessel and ductwork. Piping and valves were assembled using PVDF. The scrubber is designed for a classified area with explosion proof motors and instruments and is provided as a turn-key installation. Another example is a process vent scrubber for a blending facility in South Carolina that produces crop protection products for agricultural markets. The vent stream is 1,500 cfm and includes HCl and water soluble particulate greater than 3 micron in size. The Envitech lab scrubber was configured to include a low pressure drop Venturi for particulate control combined with a packed bed absorber for HCl control. The system includes instruments, control system, recirculation pump, pre-assembled piping, valves, and fittings, interconnect duct, ID fan, and stack. A different use for a lab scrubber includes an ethylenediamine (EDA) scrubber installed in the South Eastern United States. The storage of this precursor chemical requires extra handling than is typical with other common industrial chemicals. With a relatively low exposure limit of 10 ppm, storage tanks must be properly engineered and scrubbed to remove excess vapors. The Envitech lab scrubber is an ideal, low cost solution for this type of storage system. Please click on the link below to download a brochure and case studies for the lab scrubber. Sulfuric acid plants manufacture acid by burning sulfur with air in a smelter to form sulfur dioxide (SO2), oxidizing sulfur dioxide catalytically into sulfur trioxide (SO3), and absorbing sulfur trioxide into water to form sulfuric acid. An unwanted coproduct of sulfur combustion is nitrogen oxide (NO). In the catalyst beds, nitrogen oxide partially converts to nitrogen dioxide (NO2) and the two react with sulfuric acid to form nitrosylsulfuric acid (NOHSO4). Candle filters located downstream of the catalyst beds collect most of the nitrosylsulfuric acid. Candle filters require periodic maintenance. To maintain the equipment, operators wash the candle filters with water to remove the sulfuric acid contained within them before entering the candle filters for maintenance activities. Unfortunately, water reacts with built-up nitrosylsulfuric acid to reform NOx. Since there is no diluting gases, NOx concentrations leaving the candle filter during the wash may be very high, both dangerous to operators and potentially forming an opaque brown cloud. Recently, Envitech developed an economical solution to this problem by designing a mobile NOx scrubber. 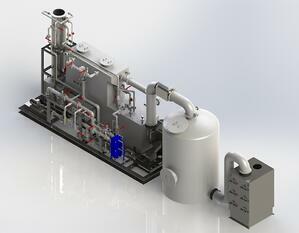 A mobile NOx scrubber, rather than a fixed system, has several advantages in this application. First, a mobile system does not consume valuable footprint during normal operation. The area around the candle filters is often congested. A fixed system requires "shoe-horning" the equipment in a hazardous location, adding cost. A mobile solution provides flexibility to position the scrubber in optimal locations near the candle filter without permanently consuming valuable space. Temporary utility connections suffice for a mobile solution, further reducing installation costs. Second, a mobile scrubber can service multiple candle filters or other process vessels, even at different facilities. Finally, Envitech's mobile scrubber is multi-functional, designed to abate a number of hazardous chemicals in addition to nitrosylsulfuric acid, such as hydrochloric acid, sulfur dioxide, and other soluble gaseous emissions. Envitech's mobile NOx scrubber offers the ability to abate over 99% of the NOx emissions during maintenance activities for flow rates of up to 1,000 acfm for a single reagent system and 15,000 acfm for a multi-reagent NOx reduction system. Envitech's mobile NOx scrubbers are fully automated, stand-alone scrubbers requiring only utility and gas connections, and configurable to handle a variety of pollutants. If you are interested in more information about Envitech's mobile scrubber, click on the link below to download a cut sheet for the scrubber. Last March I gave a paper and presentation at the International Conference on Thermal Treatment Technologies and Hazardous Waste Combustors (IT3/HWC) in Houston, TX. The paper discusses the challenges for meeting ultra-low emission limits for medical waste incinerators. Wet scrubbers are used to control hazardous air pollutants (HAPs) on many hospital, medical, and infectious waste incinerators (HMIWI). The Maximum Available Control Technology (MACT) standard for these incinerators was revised and became final in 2009. The new standard has the lowest emission limits for incinerators today. The limits exceeded the capability of systems designed to the previous standard with respect to particulate matter (PM), lead (Pd), cadmium (Cd), mercury (Hg), and dioxin/furans (D/F). By 2014 all existing medical waste incinerators were either shut down or upgraded to comply with the new standard. 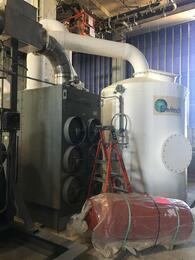 Envitech successfully upgraded four existing medical waste incinerators. A paper presented at the 2012 IT3/HWC conference describes one of these systems which was installed at the National Institute of Health (NIH), Rocky Mountain Labs. The challenge moving fo rward will be new medical waste incinerators which have even more stringent, ultra-low emission limits. Building a new incinerator requires critical decisions on control technologies and permitting. The IT3/HWC paper reviews these issues for specific HAPs and discuss trade-offs between permitting a new medium size incinerator versus a large incinerator. An example is provided of an air pollution control system meeting the emission requirements for a new large medical waste incinerator at the University of Texas Medical Branch (UTMB) in Galveston, TX. Envitech is also building gas cleaning systems for two new medium size medical waste incinerators for a research facility which integrate NOx control using ozone injection. Please click on the links below download the presentation and paper. Ethylene amines are one of the major chemical building blocks. Ethylene amines include ethylenediamine (EDA), diethylenetriamine (DETA), triethyltriamine (TETA) as well as other longer chained ethylene amines. Amongst its many uses, ethylene amine is one of the two principal chemical ingredients in making ethylenediaminetetracetic acid (EDTA), the most common chelating agent in the world. Diamines are also used in the manufacture of the ubiquitious textile Nylon. Due to its excellent properties, it is also used extensively in the asphalt, petrochemical, rubber, pesticide, and paper industries. The storage of this precursor chemical requires extra handling than is typical with other common industrial chemicals. Ethylene amines possess relatively low OSHA exposure limits of 10 ppm or less and have a vapor pressure akin to water; thus vent points in ethylene amine storage systems must be properly engineered to avoid hazardous conditions, and scrubbed to remove excess vapors. 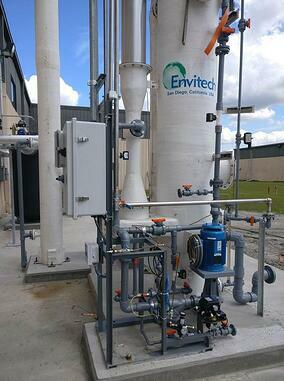 Envitech manufacturers a packaged vent scrubber for the control of toxic compounds like ethylene amines. Envitech's vent scrubber is simple in design, constructed out of stainless steel or other corrosion resistant materials, and available in several sizes and customizations to meet individual storage needs. The vent scrubber uses water to capture ethylene amine vapors from any process vent. The scrubber is designed for batch or continuous use and can meet OSHA requirements for all classes of storage tanks. The system only requires water, power, and a drain, and installation is easy and straightforward with single point connections for all utilities. If you are interested in more information about Envitech's vent scrubber, click on the link below to download a cut sheet for the scrubber. Venturi Scrubbers are used to control particulate on a wide range of applications including medical and hazardous waste incineration, pot ash mining, sewage sludge processing and incineration, coal drying, textile and mineral wool insulation manufacturing and copper roasting. A previous blog post in April discusses the mechanisms for particulate removal by a Venturi scrubber. One application for Venturi scrubbers is removal of fumes generated by a Banbury mixer. A Banbury mixer is an industrial mixer used in a wide range of applications including food, chemical, pharmaceutical, plastic, mineral, and rubber processing. Banbury mixers are used, for instance, to compound rubber material for manufacturing automobile tires. Uncontrolled fumes from the mixers can create a nuisance by settling around the facility. Envitech’s Venturi collision scrubber has been used to control these fumes. The figure on the right shows a typical Venturi collision scrubber for a 25,000 cfm mixer exhaust. The scrubber separates the exhaust into two streams internal to the scrubber. The streams are then directed to two opposing Venturi throats. Recirculated water injected into each throat is atomized into fine droplets as the gas is accelerated. Fume particles and droplets collide and are captured by the atomized water as the steams are recombined into a third Venturi throat. A diffusion section redistributes the gas to a horizontal chevron style mist eliminator to remove entrained water droplets. Water is collected and drained into a common sump and recirculated back to the Venturi throats. A blowdown stream purges the collected material. The scrubber is designed for 24/7, semi-automatic operation and is skid mounted with redundant pumps, one operating and one spare. Instruments are pre-mounted into the piping assembly and pre-wired to a junction box. The systems are often provided with an ID fan which can be mounted on the roof of the building. Typical design conditions and performance are indicated in the table below. Envitech Venturi collision scrubbers have been in operation at several tire manufacturing facilities since the early 80’s. Over 17 systems have been installed including several in recent years. Click on the icon below to download a case study for Envitech Venturi Collision scrubbers learn how the scrubber solved the emission problems for Goodyear Tire & Rubber Company. Venturi Scrubbers are used to control particulate on a wide range of applications including medical and hazardous waste incineration, pot ash mining, sewage sludge processing and incineration, coal drying, tire manufacturing, and copper roasting. One particular application is glass fiber manufacturing which can include both textile fiber and wool fiber insulation. Both types of fibers are manufactured by similar processes which use high-temperature to convert raw materials (predominantly borosilicates) into glass fibers. Emissions control is needed for both glass melting and fiber forming and finishing processes. A survey of stack test data from 10 manufacturing lines at different glass furnace operations demonstrate typical particulate emissions in the range of 0.0035 gr/dscf to 0.015 gr/dscf for volumetric gas flow rates ranging from 20,000 dscfm to 50,000 dscm. Most of these lines use a 10 in. W.C. pressure drop Venturi scrubbers. 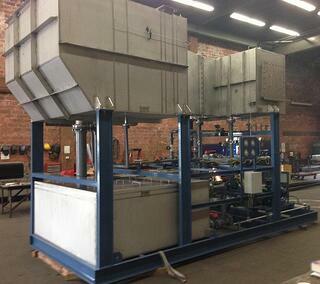 A few use wet electrostatic precipitators (WESP’s). Stack test data and particle size distribution (PSD) data indicate there can be significant differences in particle size distribution between different glass furnace manufacturing lines which account for the range in outlet concentrations. The figure on the right shows removal efficiency by particle size for a 10” pressure drop Venturi. It indicates that nearly all particles > 2 micron in size are removed by the Venturi. Performance drops off dramatically, however, for smaller particles. Mechanisms for particulate removal by a Venturi scrubber are discussed in more detail in an earlier blog post, dated April 14, 2016. The image below shows a typical Venturi scrubber used for glass fiber manufacturing facility. The process exhaust gas passes through the Venturi scrubber throat for particulate removal. The Venturi has a variable throat damper that is pneumatically actuated for maintaining the Venturi scrubber pressure drop over a minimum and maximum gas flow rate. The damper position is governed by proportional-integral-derivative control based on the differential pressure across the throat. After the Venturi scrubber throat the gas passes through a flooded elbow and enters a vertical entrainment separator through a tangential inlet. Large water droplets are removed by centrifugal forces by the spin induced by the tangential entry. After passing through internals to smooth the gas flow distribution, the gas passes through a vertical chevron style mist eliminator to remove remaining water droplets from the gas. A spray header provides a periodic wash to keep the chevrons clean from particulate and debris. Liquid from the Venturi is collected in the entrainment separator sump and re-circulated to the Venturi throat. A blowdown stream is taken from the recirculation line to purge the collected particulate. Venturi scrubbers have proven to be highly reliable on a wide range of applications, including several collecting fibrous material. Several considerations should be taken into account to design reliability into the system. A well designed Venturi scrubber can operate continuously with just one or two shifts of maintenance per year. Although Venturi scrubbers are quite common on glass fiber manufacturing lines some sites have relied on wet electrostatic precipitators (WESP) to meet emission limits. This may be driven by a combination of the particle size distribution (PSD) of the process and site specific permit limits. In general, a WESP is used when there is a large fraction of submicron particulate that exceeds the capability of the Venturi scrubber to meet the permit limit. A WESP has higher capital cost, but will have lower operating cost from lower energy consumption. Click on the icon below to view a video of a variable throat Venturi scrubber damper blade. A common application for small scrubber systems is an emergency vent scrubber for laboratories. Envitech's lab scrubber is a packaged packed bed absorber designed for high efficiency removal of water soluble contaminants (e.g. HCl, HF, HBr, SO2, NO2, etc.) from the gas stream and can handle up to 500 acfm of gas at a maximum temperature of 180oF. The system is engineered for reduced footprint at 4 ft x 4 ft and includes a pre-wired control panel and pre-piped service utility connections requiring minimal installation and maintenance costs. Scrubber units are configurable to different levels of automation and treatment applications. A typical application might be a facility with a gas cylinder filling stations laboratory hood vent. The scrubber comes with a fan, pump, instrumentation, and control panel and is shop fabricated and assembled. Click on the button below to download a free Envitech Lab Scrubber Brochure.